Note:This history was written on the occasion of the 75th Anniversary of York Lodge. It was presented by Lawrence M. Looker,P.M. ; however, the author is not known. It has been edited for clarity by William H. Hochstettler III, P.M. The same idea was revived some time after with reference to Humboldt Lodge No. 476, but met with little favor. The idea being that a fifth and entirely new Lodge was the only rational plan, For some unaccountable reason all effort ceased and the scheme for securing a new Lodge lay dormant for several years, in fact up to 1890,when it was again revived by several or the Brethren issuing a call to resident Masons on the North Side to meet over the Bank at the corner of North High Street and Fifth Avenue. Quite a number responded and a temporary organization was effected, and for the first time a petition for a dispensation was drawn up. Petitions were also sent to the four established Lodges asking for concurrent jurisdiction. Before the Lodges had had an opportunity of voting on the question, it was discovered that the papers were irregular in several particulars and all were recalled for correction. Owing to the absence of some of the Brethren who were most interested and other unavoidable reasons, nothing further was done until in February 1891, when another call was issued to meet at the same place and was responded to by a large number or Brethren. An organization was again effected, this time a permanent one, with Bro, Wm A. McDonald Chairman, and Bro, J.S. Hutson, Secretary. A committee on a Lodge room was appointed consisting of Bros D.P. Adams, J.F. Hatcher and Wm A. McDonald, and instructed to secure plans of a building which would be suitable for use by a lodge and receive propositions from property owners. At this meeting, (Feb.l6, 1891) it was decided to hold weekly meetings during the continuance of the organization. At the meeting held at the office of Bro. C.A. Eckert (3rd & High) on February 23, 1891, the committee on building reported with pencil sketch of a building with Lodge room above and store rooms below. Bro. John Husk was appointed a committee or one to select a name for in the new Lodge. At the meeting of February 28, 1891, a committee consisting or Bros F.A.T. Spees, John Rusk and D.P. Adams was appointed to wait upon Bro. Ed Morrell and tender him the office of Master, Bro D.P. Adams was selected to serve as first Senior Warden and Bro. Jesse F. Hatcher to serve as first Junior Warden. At the meeting held March 7, 1891, Bro, John Rusk reported (through Bro. Adams) that he had selected the name "York", which selection was ratified by a unanimous vote. The committee on building reported one proposition in writing that was rejected as being beyond the ability of a new Lodge. The committee appointed to see Bro. Morrell was continued and the Secretary was authorized to receive the dimits of the Brethren who wished to sign the petition for a dispensation. At the meeting of March 14, 1891, the former committees were continued as they were not ready to report but on March 21, the committee on Master reported they were unable to secure Bro. Morrell and presented the name of Bro. G. W. Clarke, P.M. but as Bro. Clarke concluded he could not serve, the committee was continued permanently with full power to select. The petition was presented first to Magnolia Lodge where it met with an adverse vote, whereupon another meeting was called to meet on June 20, 1891, to determine upon future action, It was decided to prepare a new petition and go before the local Lodges as before, as assurances of approval and help had been received from the officers of all the Lodges, and from the most prominent Masons or the city, a committee of three, consisting of Bros. D.P. Adams, Rev, John Rusk and F.A.T. Spees, was appointed to prepare an address to the various Lodges, setting forth the necessity for a new Lodge. On motion, the names of Bros, C.A.Eckert and C.N.Wells were placed on the petition for the offices or Senior Warden and Junior Warden respectively, the office of Master to be filled by the committee. At the meeting held July 6, 1891, the committee reported the name of Bro. Joseph Cratty P.M. for Master, and the papers were again ready to present to the Lodges. of the city signed by the following brethren: Joseph Cratty, I.F. Haynes, S.A. Supplee, M.Zartman, C.A.Eckert, C.N.Wells, Thomas G. Neski, W.W. Baggs, Sol Tinunons and J. H. Fletcher. Brethren: We believe a brief statement of facts in regard to Masonry in Columbus, its strength and relative growth in proportion to population, the situation and necessities or Masonry as seen and understood by us, your brethren and petitioners of the North Side, will cause you to consider our reasonable request with that charity and brotherly love for which Masons have always been noted. We hereby append such statement, with reasons for asking for a new Lodge north of the railroad tracks, with concurrent jurisdiction feeling that, after you have carefully considered what is here set forth, we will receive the necessary consent and your hearty approval. Columbus Lodge was chartered in 1815, when Columbus was but a hamlet, reorganized in 1841, making seventy-six years since it was chartered and fifty years since its reorganization. Magnolia Lodge was chartered thirty-two years after in 1847, Goodale Lodge in 1866 or nineteen years after Magnolia Lodge and eight years after in 1874 Humboldt received its charter. At the date of the charter of Humboldt the population of Columbus was 26,000, an average of 9000 to each Lodge. There are now, according to the last city directory 138,000 people in this jurisdiction or about 100,888 in the city limits, thus giving each Lodge 34,500, yet in the city of Columbus with her 100,000 population we have but 850 affiliated Masons, a fact which will surprise, if you have not previously known it, a matter challenging serious consideration. Of the population of Columbus nearly one-third reside north or the railroad tracks, a population as large as the entire 'city contained when the fourth Lodge was chartered. We are free to say that such a state or Masonic inertia does not exist in another city of the United States. And what does it indicate? Plainly, that Masonic growth in this city is very feeble and its vitality at a low ebb, the increase in membership being about equal to the losses by death, removals and expulsion. There are two reasons for this condition of affairs, the first, as is well understood by all, is owing to internal dissension within the Lodges of Columbus, the knowledge of which has, unfortunately become public property deterred a large number of excellent citizens from becoming members of the Fraternity. We are not fault-finding - recognize the fact that this was forced on the brethren and was unavoidable. We might add here with truth, that it has prevented a large number or brethren, who hold dimits of membership in foreign Lodges, from uniting with us. The second cause is equally potent and has not the excuse of being unavoidable, we mean the rule of rigid exclusiveness adopted by the Lodges in preventing the formation or new Lodges - particularly as this is the case with the North Side, with a population quite equal to the entire population of the city when Humboldt was chartered, embracing a territory exceeding ten square miles, separated by an almost impassible barrier from the balance or the city, and more distant than is usual between country Lodges. You give this large and intelligent population the choice or enduring all of these hardships and inconveniences or of keeping out of Masonry. We look upon that as placing uncalled for burdens and restrictions upon us and withholding from us that fraternal regard and assistance that we had a just right to expect and that we had been taught that Masons were always ready to give. We believe that if York Lodge is instituted that it will create renewed interest in Masonry and will not only become respectable in size and the character of its members but will create an interest in and a respect for Masonry in general and that it would add materially to-the growth of the older Lodges by accessions from that part of the city. It will also add largely to the growth and prosperity of the higher Masonic Bodies, for it is safe to say that three out of four will unite with the Chapter, Commandery or Scottish Rite Bodies or with all of them. It has long been the hope of Columbus Masons to see a fine Masonic Temple erected, and honor to the Fraternity and a monument to the city. We are in perfect accord with you in that, Brethren, and when the time for action arrives you will find us right at the front, working in harmony with you for this purpose, and for all others when the good of the Craft is concerned. If you should see fit after careful consideration of the facts set forth, to grant our petition you will rind us zealous workers in Masonry, careful in the selection of material, keeping constantly in memory the Land Marks and Traditions of Free Masonry and always loyal to. the Grand Lodge of Ohio." The petition and the above address was presented to the various Lodges and their consent obtained, there being only fifteen negative votes cast in the four lodges. After consultation with the committee, Bro. Joseph Cratty, who had been selected for the first Worshipful Master, took the petitions, the address to the four Lodges and the necessary fee together with letters from Bro. Henry Neereamer, W.M. of Goodale Lodge, and Bro. Ed Morrell, Dist. Lecturer, and presented them to Bro. Levi C. Goodale, M.W. Grand Master, who promptly issued a dispensation for York Lodge. The uniform code of By-Laws was adopted which provided that stated meetings were to be held on the second and fourth Wednesdays or each month. Fees for the degrees were fixed at $30,00, and the annual dues at $3.00. 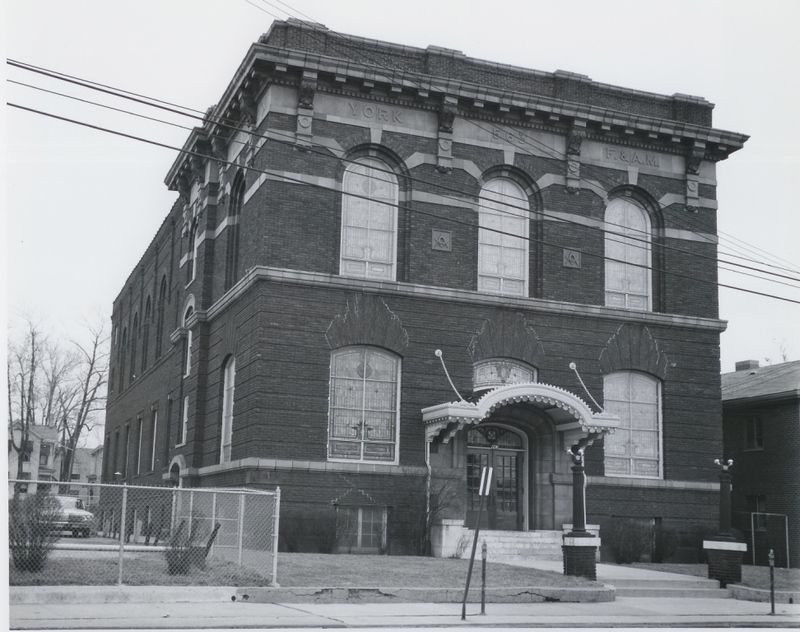 Meetings to be held in the Masonic Temple, 121% East Towh St, until suitable quarters could be obtained on the North Side. Petitions for the degrees were received at this meeting from: Dr. Guy Coulter, O.P. Megahan and Frank C. McVay. The first degree work was on October 16, when the Entered Apprentice. Degree was conferred upon Dr, Guy Coulter, This was the only work done by the Lodge while under dispensation. On October 20, 1891, the dispensation and records were presented to the committee on Charters and dispensations of the Grand Lodge then in session. The committee recommended that a charter be issued and on October 21, the same was granted, the following being named as Charter Members: Joseph Cratty, C.A. Eckert, C.N. Wells, J.H. Fletcher, Solomon Timmons, S.A. Supplee, I.F. Haynes, J.A. Worrall, Thos G. Neski, George S. Wilson, W.W. Baggs and M.Zartman. The new quarters were dedicated February 13, 1893r by the M.W. Grand Lodge of Ohio, Among those present were M.W. Bro, Allen Andrews, Grand Master and Nelson Williams, Grand Orator, who gave the principal address, In February 1893, the By-Laws were amended changing the time or stated meetings to the first and third Mondays. During the period from 1900 to 1907 there was considerable agitation for a permanent home for the Lodge. On May 6, 1907, the trustees were authorized to purchase the property at the N.W. corner of Smith Place and North High St for a future home for the Lodge, Some time after acquiring this property it was decided that the same was not suited for our use. Various locations for a Temple were considered and finally on May 6, 1914, the Lodge voted to acquire our present location and the Worshipful Master authorized to appoint a building committee and proceed with the construction of a Temple. The following committee was appointed: L.L. 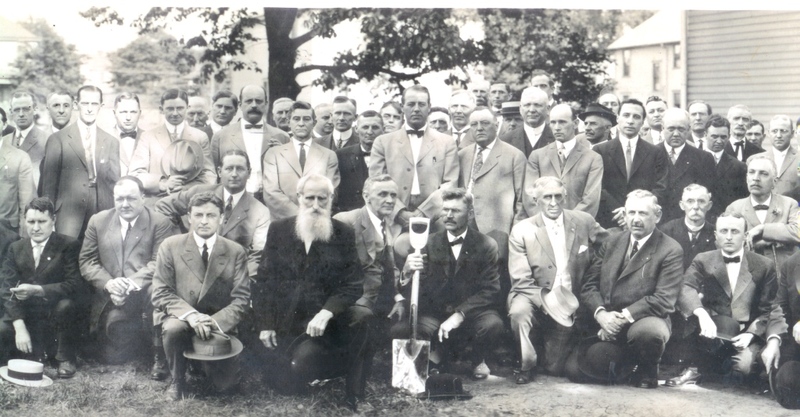 Larason, Chas T. Warner, John F. Fergus, J.B. McGaughy and David E. Huston Chairman, The committee secured plans which were approved by the Lodge and ground was broken May 23, 1914. The Corner-stone was laid October 21, 1914, by the Grand Lodge of Ohio, then in session, M.W. Bro Charles J. Pretzman, Grand Master, presiding. Construction proceeded under the direction of the Building Committee and the Temple was completed and furnished in October 1915 The Temple was dedicated with appropriate services by the Grand Lodge on November 4, 1915, MW Bro, Frank H. Marquis, Grand Master, presiding. The Lodge experienced its greatest prosperity in the years immediately following the completion of the Temple- 1916 to 1921. During the year ending July 1921, there were- 218 candidates raised. During the seventy-five years there have been 1646 stated meetings and this is the 2625th special meeting 4328 have been raised to the sublime degree of Master Mason.